3credit: Prevent 1 net damage. trash: Prevent up to 2 brain damage. It still hurts, a bit, the first time. The second time, you feel nothing at all. But don't push your luck. The new sliced bread against Jinteki. Playing this against PE is basically like eating at a taco buffet, without the painful hours of running into the bathro--- umm ice. This card, Deus X and Net Shield are the only real answers as it stands up to "All That Remains". A really costly, but sound way for people to get in since most PE decks will flat out lose to this since they prefer to flatline, rather than score. Obviously it's best in a shaper deck, only because of Mopus, but is also a cheap splash at 1 influence. Try it with syrup, or à la mode. Is this better than Net Shield? I personally don't think so. 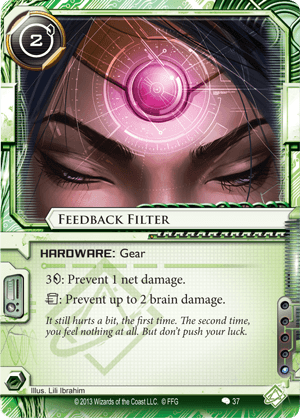 Net Shield is what you want against the constant pinging of Jinteki: Personal Evolution if you're going for card loss prevention. Even against something like Snare!, you just pay the 1 and take 2 damage. That to me is worth more than paying 9 for Snare! and 3 for each ping. That said, it is a piece of hardware so it helps in regard to memory if that's a problem.